After a few weeks of resting in parchment at our Guatemalan Warehouse, the first coffees from this harvest have been milled and are sailing this week! These are coffees picked during the first half of February and rested for 6 - 8 weeks in parchment for humidity to homogenize. With the first coffees sailing in the coming weeks, we have now prepared a preliminary offer list! This is the first chance for you to see the new coffees and producers we have been working with this year. Let us know if you see something you might fancy and we'd be happy send samples and/or take reservations. Keep in mind that this is not our final list of coffees - we will be updating this list as more containers are ready to be shipped so make sure you visit us frequently. If you are looking for something in particular, or have a strong inclination toward a coffee please get in touch with us! CHECK OUT OUR 2019 OFFER LIST! At the peak of the harvest, we bring you an update! We have cupped over 1000 offer samples, visited some amazing producers, their plantations and wet mills. We thank all the roasters who have visited us this harvest! Our Wet mill has been in full swing for over a month - receiving and processing over 400 bags of cherry every day from various Associations and Groups of producers in Fraijanes and Nuevo Oriente. And finally, our dry mill is almost ready with a brand new Electronic Color sorter for Micro lots - the Delta mini sorter! This will help us sort the beautiful coffees in a better and more efficient way. Huehuetenango, or “Huehue” as we often call it, is a coffee growing region located in North Western Guatemala. This mountainous region is well suited for growing coffee due to the high altitudes and micro climates. Only in Huehuetenango, 20,000 families are registered with the coffee producer organisation Anacafe. Almost all of them have their won wet mill, which makes Huehue one of the places with most wet-mills. Huehue produces apron. 1 million quintales (100 pounds) of parchment every year which makes it the second biggest coffee region by production in Guatemala. Due to the mountainous landscape the climate in Huehue is perfect for coffee growing. The temperature drops at night and warms up during the day. Additionally to the climate the farms are typically located in high altitudes, from 1500 mts. up to 2000 mts. above sea-level. What makes Huehuetenango so great is the large range of producers and farming styles. Many of the farms have kept the classic varieties like caturra, bourbon and catuaí and the new generation of producers are open to changes and improvements in their farms, and mills. Some producers have even started to experiment with alternative processing methods like naturals and honeys. We forecast there to be more naturals and honeys being processed here in the future not only because of their amazing flavour but also because of their lower water usage, making it a more sustainable processing alternative. Year on year, we are reassured by the amazing cup quality that Huehuetenango has, making it a region we love, cherish and focus on. Our two full-time agronomists (coffee producers themselves) José and Rodolfo don’t only manage our warehouse in Huehue but also go around the area to share their knowledge with all other coffee producers. They provide support and information for processing and varieties, sustainable farming as well as off-season farm management. This year we will again bring you many beautiful coffees from various producers of Huehue! There are a couple of different flavors profiles found in Huehuetenango, one being sweeter and balanced and one being floral, complex, tomatoey (yes believe it or not!) and tropical fruity. These really are coffees we are excited about and can’t wait to share them with you in just a couple of months! 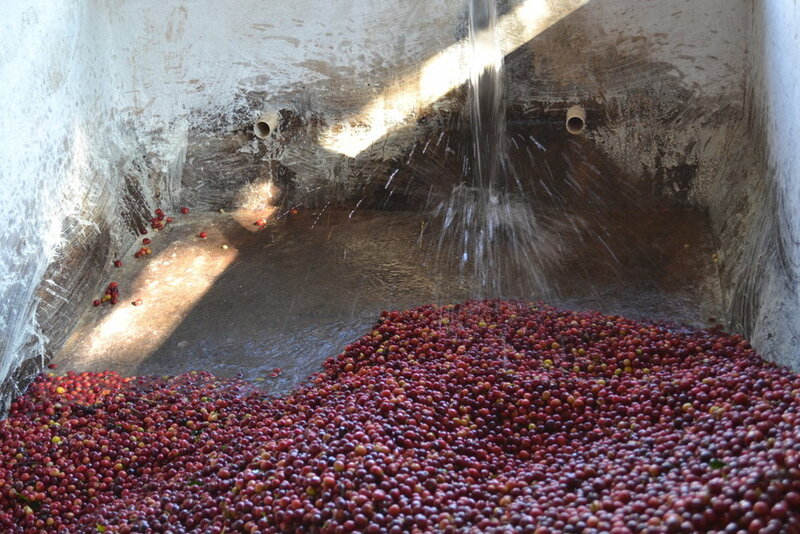 Our very own wet-mill in Finca El Hato, Santa Rosa has been receiving a lot of amazing cherries to process in the past month. We have seen Yellow Catuaís being processed as honeys (we are also making some naturals for you funky fruit lovers) and many other beautiful washed lots we are excited to share with you! Our dry-mill almost ready to get the parchment off your coffee We are installing a new electronic color sorter at our mill which makes our milling even more efficient and precise. We are very close to the start of exporting season, so stay tuned for the offer list from the 2019 harvest!